Hooray for our First Day! There's a lot of pics here, I tried to shave them down, but it's hard to curb the Awesomeness, I just couldn't do it. I love this place, and taking pictures is even better. For our first day in the Disney Parks, we chose Magic Kingdom. I guess I just Have to. I have to meet Mickey first. And Jacob just figured out this month, Ma-ow, is how he says Mickey Mouse. And he loves Mickey! He points him out on our shirts, and he helped make a tie-dye mouse shirt too. We used them on Day 1, and again for Magic Kingdom day. The boys were so excited. The park normally opens at 9, but on this day, they had an extra early Magic Hour at 8 for those staying on site. That would be us! So we arrived at just after 8. We didn't hear anyone singing for opening, but still, we had a good chunk of time before the rest of the world could enter. We were avoiding the crowds! Here's an Earful of Family ready to go in! First we stopped to get the Disability Access Pass for Chris. There was no wait getting the DAS pass first thing, so we crossed the street to go Meet Mickey. That line was 25 minutes when we got in. Just under the wire of Christopher's tolerance. Luckily, they have some fun things on the wall while you wait to entertain the kids. So Chris did ok...and so did Jacob. We were off to a great start! When Jacob saw Mickey for the first time, he called out, "Oh, isa Maow!" And when it was our turn, he ran right up to him to give him a hug. And a fistbump. He wanted to look and touch, so finally Mickey held him so we could get a couple decent pictures. All of us, seeing Mickey. Yeah, we got Ears, Say Cheers! As we were exiting the Mickey Gift Shop, we found Snow White, and the line for her wasn't long. I'd never had the privilege of meeting her. Chris wanted to ask her, how did the apple taste? I know he did, but I can't remember the answer. She had Snow White's squeaky voice, and tiny flirty manurisms down pat. It was pretty nifty. I had to go potty, so the boys met Tinkerbell without me. By the time they got out, I was in line to meet Minnie. She's my favorite now. All of us with Minnie on the Town Square. By 9:30 we'd met all the characters on the town square, and gotten our DAS pass. It was Great! That pass worked so well. It's a little different this time, they took Chris's picture, and asked a couple questions about his issues. I said he doesn't do well in lines over 30 minutes. We've now had two stops just this trip alone to prove the truth in that. So, with this DAS pass, we can go up, check in at the Fast Pass line, and they'll give us a time to return. We don't even have to bring him to the gate, in the event, (and it would've often) made him upset, then we do our waiting by getting a snack, or riding something different, then we can come back and walk right into the fastpass line. It worked well for us. We used it a bit more this trip than we had in the past, because the crowds were a little crazier, so any time we encountered something that Chris wanted that we didn't already have fastpasses for, with a wait over 30 minutes, we would DAS it. So we headed to Tomorrowland, and I grabbed a smoothie, and DAS'd Tomorrowland Speedway which was already filling up, so that we could use our Buzz Lightyear Fastpasses and come out and ride in the cars. Guess who wanted more of my smoothie than I did?! 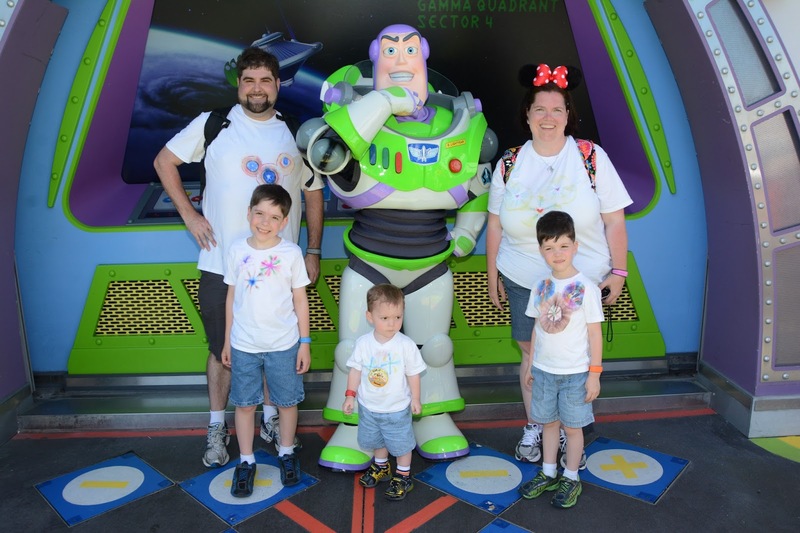 Buzz Lightyear's Space Ranger Spin was a Huge Hit with all of us but Jacob. I don't think he likes rides in dark rooms. However, he loves Buzz Lightyear. He was iffy about the ride, but at the end, they had a small meet and greet with Buzz himself. So we did that. Jake said Ba! He likes Buzz. He also likes to go "pew pew" with anything that will shoot. From Buzz we ran on to the Speedway. I love this pic, it's a few of my favorite things. Sam was driving. (My left foot was operating the pedal) He manned the wheel, as we passed the castle and the flags. A Perfect moment in a Great Day! After our race, we were hungry. So we were Lucky enough to have Reservations for Be Our Guest. Initially, we almost had a problem, as our reservation was for 1 person, but the Castmember was kind enough to let us all in. It's a Quick Service Restaurant, so we ordered sandwiches and stuff, and then we chose where sat. The boys wanted to sit in the West Wing... even though it's Forbidden. But the Master was letting guests in. ;) I thought it might be spooky for them. But no, they were thrilled. And yes, I tried the Gray Stuff. It Is Delicious! My sweet princes by the mural. Here's another Awesome one I got of Beast's Castle. The entrance to Be Our Guest is underneath. From Be Our Guest, we popped next door to Enchanted Tales with Belle. The first question they asked was if anyone knew how to march? Well, I pointed to Eric. Christopher participated too, he got to be one of the kitchen plates. Sam was too shy. But our Belle was sweet, and the story time was kind of fun, acting the movie out in 15 minutes or less. But then the littles were sad they hadn't participated. 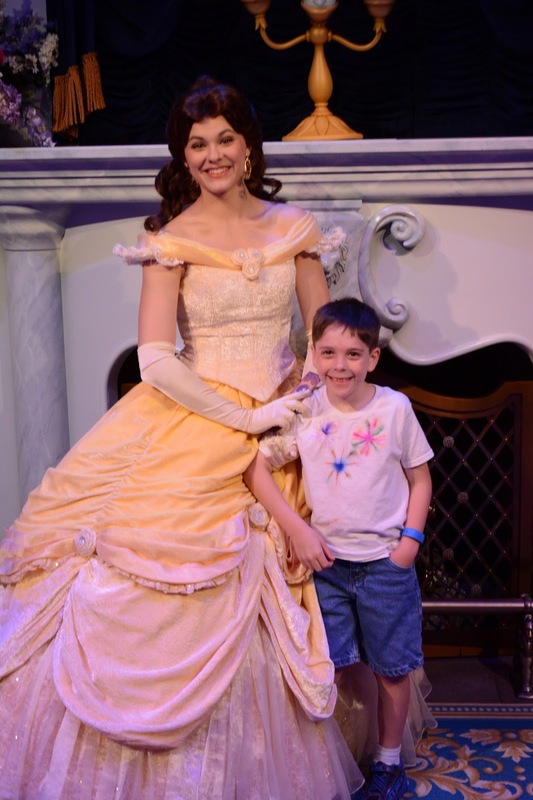 I wish they'd offered to take pics of Belle with ALL kids, not just the participants. After our Beauty and the Beast adventures, we headed back into Fantasy and the big boys and I rode the Teacups. It was the longest line I'd ever been in for Teacups...being 20 minutes. Still, we alternated hot and cold, because some of the line was in the sun. So it was an Extra Good thing that we'd sent Eric and Jacob on a very special Errand, to go pick us up some of Lefou's Brew. It's fruity and sweet, and fabulous! After getting so hot in teacups line, I think I'd gotten more sun, and E had the diaper bag. So when this appeared, I was thirsty so this was a great relief! Look who else was hanging around the Teacups! I was pretty Thankful that in spite of Being Late, the White Rabbit took a few moments to pose with some sweetboys. Then it was time to go back to our room for a rest. The boys were hot and tired, and not very happy we were making them leave the park. But a good cool rest is what we all needed. Especially me, because the bad sunburn I'd gotten at the Legoland pool on my back, shoulders and legs made me hurt so bad during the heat of the day. I needed to get out of the heat for a bit. Taking the boat back to the hotel was a brilliant idea. From the Grand Floridian, the fastest way to MK is the monorail, but the monorail has to go the long way back around to get to the Grand Flo, so it was actually easier when there was no line to take the boat, since Grand Flo was first stop off the boat. So we did it a couple times. After naps, we headed back over to Daddy's favorite Pirates of the Carribean, to ride it before they were closing it on Monday, for 3 months of refurbishment. Then Chris and I checked in at Splash Mountain for a DAS pass. While we waited that out, we ate dinner at Pecos Bill's. Did you know they have a Fantabulous toppings bar to top your cheeseburger or fries or whatever? Awesomesauce. I never knew. Chris was really nervous about Splash Mountain, but of course, he ended up having a Wonderful time. We got a little wet, but not too bad. We hopped on the train as the sun was going down, and got off at Main Street, just in time to catch the parade. Here's some hot sweetboys on a train. I love this pic. I'm so happy I packed things that glow for every evening. They were so thrilled with their light sabers. We got space in our favorite spot by the Town Hall to watch the Main Street Electrical Parade. This is my favorite part. And my favorite float. And the best picture I got of the parade. As the parade ended, we decided to head back to the hotel. So we headed straight for the boat again. This time we got to catch the Water Parade. It's a neat bunch of floats that cruise by on the lagoon. It was also amazing to have the opportunity to see it right by the water. As we got off the boat, we noticed a number of people sitting by the edge of the pier. They were getting ready to watch the fireworks. So I sat down in front of the fence, and broke out headsets, glow sticks, snacks and we watched the fireworks too. They didn't initially need them, just wanted them, but about halfway through, I was glad they had them. The sound Really travels over the water. This was our view of the fireworks, we got to see them, and only the top of the castle, covered by trees and water. Still it was a neat experience. We could even hear the music being pumped in from Narcoosee's right behind us. The music wasn't loud, but I didn't get much time to focus on photos, the kids spent the entire show griping how tired they were. Then as soon as it was over, they were What?! It's Over Already?! But watching it from the Grand Floridian was Amazing. I'd totally do that again... someday, without tired little ones.